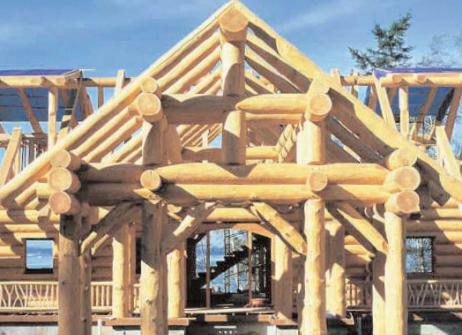 Compared to residential construction, log homes present many unique challenges. One of these are the jacks used for leveling. Joyce/Dayton joined forces with master distributors in the logging industry, and implemented a solution that addressed many of the challenges facing builders when leveling log homes during construction and throughout the life of the home. Unlike conventional residential construction, log homes present a challenge because their heavy support columns need to be leveled over a period of several years due to shrinkage and foundation settling. In log construction, the heavy support columns generally require unsightly screw/nut arrangements that are typically exposed to the elements. The builder can only level in a downward direction with a large wrench and a significant amount of manpower to make the adjustments. Joyce/Dayton developed compact Worm Gear Machine Screw Jacks to be set within each of the support columns. These heavy duty self-locking machine screw jacks are offered in 5 and 10 ton capacities with a vertical travel of six inches. Since these jacks are designed with lifetime lubrication, they can be neatly fitted into the support columns away from the elements and out of sight. The support columns have holes drilled into one side for quick access to the jack adjustment mechanism and can be plugged once leveling is completed. The jacks are supplied with a custom hex input shaft for attaching a power drill. Due to the high worm gear reduction ratio, the builder now has a unique and simple adjustment method for leveling the columns in both the up and down direction. Safety - The use of a power tool rather than the large wrench reduces strain and therefore the risk of worker injury. Additionally, the jack is safely hidden in the column which eliminates the chance of unwanted tampering. Durability - Joyce jacks are equipped with tapered roller bearings, high tensile bronze nut and lifetime lubrication which eliminate the need for ongoing maintenance. The rugged compact jack design allows the jack be nestled into the column and no longer exposed to the elements. Overall Performance - The time required to remove and replace coverings in order to adjust the old screw/nut arrangement is completely eliminated with the Joyce jacks. In addition, the ability to adjust upward as well as downward, previously not an option, greatly reduces the amount of time spent leveling. In fact with the previous screw/nut arrangement, the average amount of time it took to level a home was 3-5 days. With the new Joyce jacks, that time is reduced to less than half a day.